We live in a world shadowed by climate change. This crisis is often conveyed using numbers and figures – rather than stories of human experiences. The political changes proposed are often focused on economic or technological solutions – rather than moral or psychological aspects. Very little is said about the need to question our lifestyles, worldviews and relationships with the more-than-human world in our response to climate change. 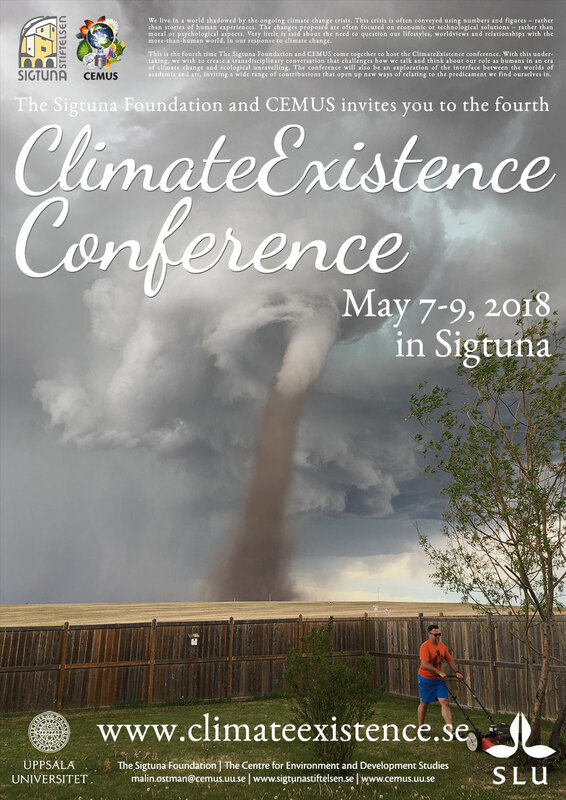 This is the fourth time The Sigtuna Foundation and CEMUS, Centre for Environment and Development Studies, come together to host the Climate Existence conference. With your help, and together with artists, scholars and actors from a variety of fields, we hope to inspire a transdisciplinary and reflective conversation that challenges how we talk, think and act as human beings in an era of climate change and ecological unravelling. In 2018 we gather to unsettle some of the frames, structures assumptions that shape our understanding of the world. Not necessarily to escape existing ones, but rather to explore the cracks were there is potential for alternative patterns to emerge. We hope to collectively draw maps that inspire clarity, wisdom and imagination for humanity to be able to choose more humble and safe trajectories than we are currently on. This year we focus on the interface between the worlds of academia, art and politics, inviting a wide range of contributions that relate to the predicament we find ourselves in. Warmly welcome to ClimateExistence 2018!